This host has a distinctly unimpressive website, but great products and a 60-day money-back guarantee make Hostwinds likely to be worth the risk. Not decided which type of website hosting you need? Hostwinds does its best to help by offering you every possible option: shared, business, vBulletin, reseller, VPS, dedicated, budget Linux, premium Linux, Windows and more. The ‘Basic’ plan starts at $3.29 a month on an annual subscription and comes with a surprising number of features. These include unlimited bandwidth, disk space, email accounts, databases and subdomains. There's also cPanel access, Weebly site builder, Softaculous one-click installs, nightly backups and a free dedicated IP address. Basic accounts are limited to one domain each. With such a powerful starter plan, there's nowhere for the rest of the shared hosting range to go. The ‘Advanced’ package weighs in at $4.23 per month when paid annually. It offers all the ‘Basic’ plan has to offer but with 4 domains instead of 1. The top tier ‘Ultimate’ plan, which Hostwinds market at their best seller, starts at $5.17 per month when paid annually. This adds unlimited domains and places you on a server with fewer accounts. Although 'web application hosting' is listed on the website, there's no managed WordPress or e-commerce plan, just a link to the standard hosting accounts. If you need more resources, VPS subscriptions start at $4.49 a month for an unmanaged Linux server with 1 CPU, 1GB of RAM and 30GB of disk space. Dedicated server plans start from $106 a month. Although there aren't many server types, they're all reasonably customizable. All products are covered by a 60-day money-back guarantee. That's a big improvement on the industry-standard 30-days, although there are a few hosts that go even further (InMotion Hosting gives you 90-days, for example). The Hostwinds website doesn't give you much low-level detail on its plans. The comparison table on the main page only provides information experienced users would guess anyway. The control panel comes with a web-based file manager, AWStats and Webalizer. During account setup you can enter a new or existing domain name. Next, Hostwinds offered us an Advanced Website Monitoring add-on. This automatically raises a support ticket if your website goes offline or stops loading, and it means your site is likely to recover more quickly from common issues. You also have the choice whether to sign up to a monthly or annual plan. As with most hosting packages, there is a discount when you choose to pay annually. 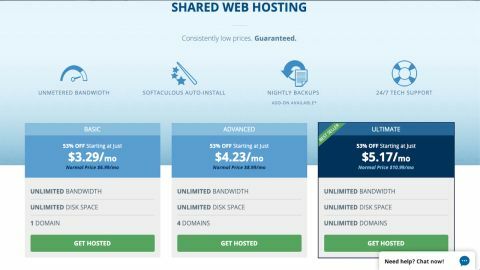 The ‘Web Hosting Cloud Hosting’ Add on is automatically added to your basket for another $36 per year. If you don’t want this included, make sure to uncheck the box beside it. Hostwinds supports payment by credit card,PayPal, Bitcoin and Skrill. We chose to pay by MasterCard and our payment was accepted with no issues. All pans renew automatically. Hostwinds completed the process by sending an invoice by email. There was no waiting period – we were able to start work right away. The customer portal is clean and straightforward. There are no banner ads, no marketing at all, just a tabbed interface which gives you easy access to all your features: Services, Domains, Billing, Support, Tickets and more. The portal has no direct site management tools, but there is a Login button which takes you to a regular cPanel installation. If you've used cPanel before you'll find your way around immediately. If you're a beginner it'll take longer, but you can learn things bit by bit. The File Manager and FTP Accounts are two of the icons at the very top of the page, for instance – you can use both of these to upload a site you've already made. We also checked the software versions used by Hostwinds: cPanel was the most recent version as was MySQL. PHP comes preinstalled on all servers via cPanel. PHP MyAdmin is used to manage your databases. All Hostwinds plans include unlimited mySQL databases. Although it's barely mentioned on the site, Hostwinds includes the Weebly site builder. This includes a selection of templates which can be easily dragged and dropped into place. Weebly is perfect for users new to website building as no knowledge of code is required and Hostwinds comes with a step-by-step guide. The other site building highlight here is Softaculous, one of the best frameworks for finding, easily installing and managing hundreds of applications: WordPress, Joomla, PrestaShop, Drupal and more. You could set up WordPress in a couple of minutes, for instance, just by filling in a form. The whole process of getting started on your site can be a bit confusing for newer users. If you are looking for a more straightforward and user-friendly web hosting provider, it might be an idea to check out Yahoo Web Hosting. This is straightforward and simple to use with plenty of help and support for those who find themselves on unsure ground. No single review is able to reliably tell you how a host will perform over time. What we try to do instead is look more closely at the website, the services, and the kind of support you get. If a host is cutting corners, it's more likely problems will occur later. You can either open a support ticket, search the Knowledge Base, call the customer support line, send an e-mail or click on the “Live Chat’ icon to be connected with an agent within minutes. We found the agent more than capable of dealing with the variety of queries we posed to them and they also answered each in a timely manner. When we last looked at Hostwinds, we uncovered a security issue with cPanel, which displayed your password in clear text if you tried to change it. This has since been fixed: cPanel will now only change your password if you enter the old one first. Hostwinds Knowledge Base contains a variety of articles arranged under different categories. There isn’t as many as we have seen in other knowledge bases but there is enough to be helpful. You can also use the search feature to locate helpful guides such as 'How to install WordPress'. The last time we looked at Hostwinds, we lamented the fact that it wasn't possible to install different versions of PHP on multiple domains if using a shared hosting plan. After raising a support ticket, a company representative explained that this wasn't possible as it would affect other customers using the same server. This time round, when queried, the support team responded to our ticket in 22 minutes with a link to a helpful guide in the provider's knowledgebase demonstrating how to use 'MultiPHP', which allows you to select different PHP versions via a drop-down menu. This was much faster than some other providers where it took several hours to get a response to a ticket we raised. We completed our tests by running Bitcatcha and other benchmarks on our server. This seemed to be located on the western side of the US, so connections from the UK took fractionally longer. You're unlikely to notice any issues, though, and the performance to the US and the rest of our test locations was good, meaning speeds were above-average overall. This web host's feature-packed plans seem great value. The 60-day money-back guarantee makes it worth trying out but be sure to test the service in-depth. This is particularly important if you don't have a dedicated server, as you may need a different software version to those that are pre-installed. Nevertheless, Hostwinds is suitable for most applications and offers excellent value for money, so you have little to lose by trying it out.